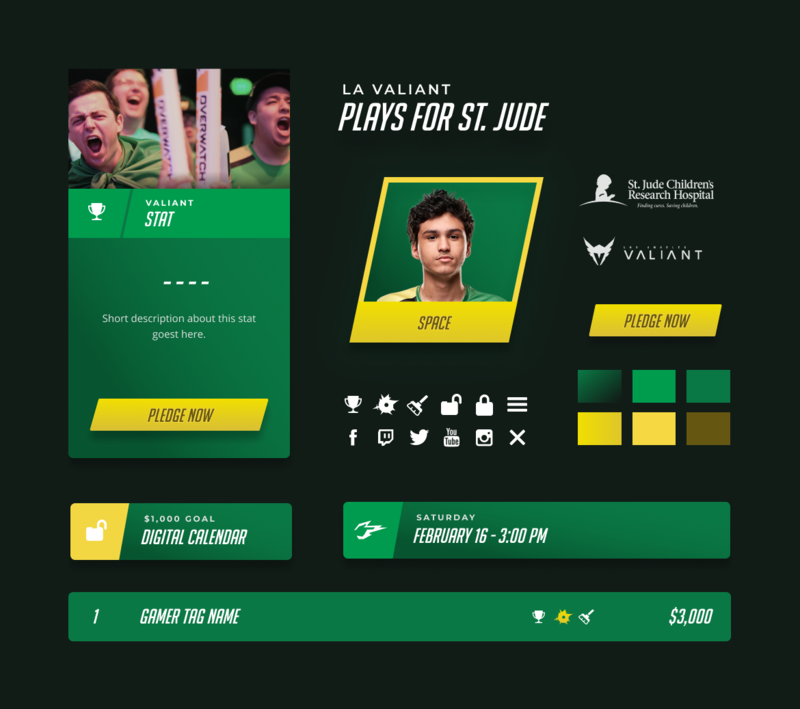 The Los Angeles Valiant, an Overwatch League franchise team, joined up with St. Jude’s hospital to raise $500,000 to help support kids battling cancer. 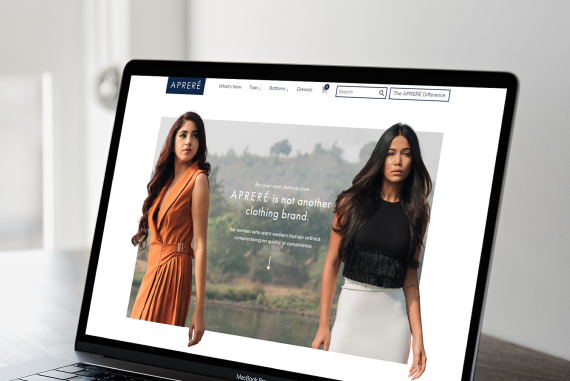 I worked in collaboration with the Andculture team on this marketing project. 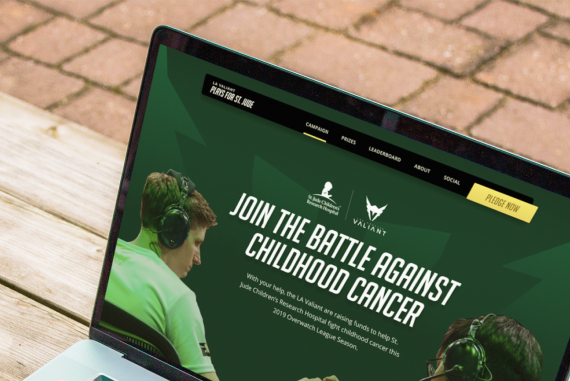 The main goal was to bring a fresh engaging design to successfully raise money for the PledgeIt campaign. I was specifically tasked with branding and designing the new 2019 website. Having three separate call-to-action items is a challenge on any web page. 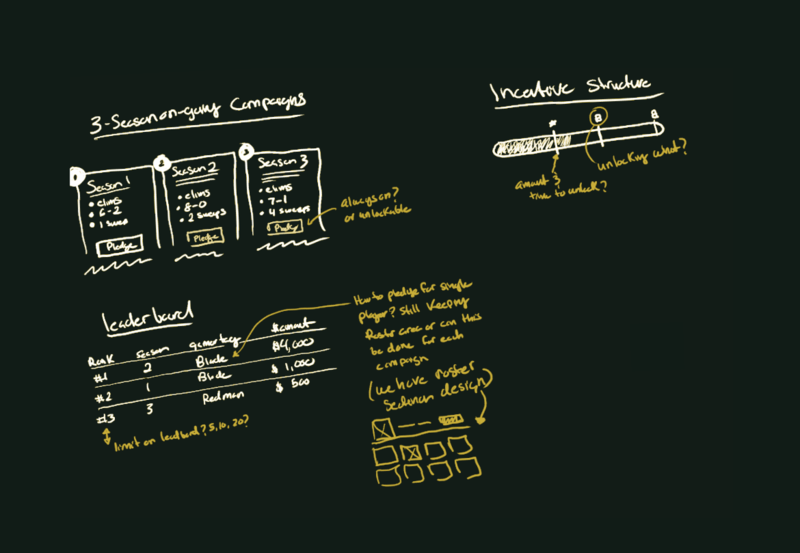 So early on it was important to plan out what would be displayed for each one of the campaigns, that way we could be in sync with the PledgeIt fundraiser sites. My goal was to ensure potential donors could determine which campaign they wanted to pledge to quickly by highlighting key stats. During this stage, I focused on the preliminary ideas to communicate the donation incentive structure. 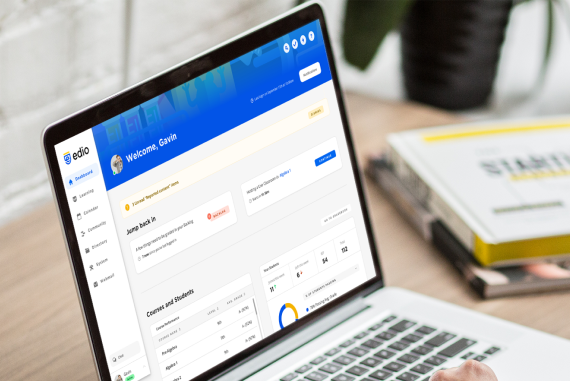 Though this was a smaller project, it was useful to create a small component library to maintain design consistency, flexible updates, and for collaboration with the developer handoff. I paired with a developer through the process to ensure the build of the website was executed as intended. 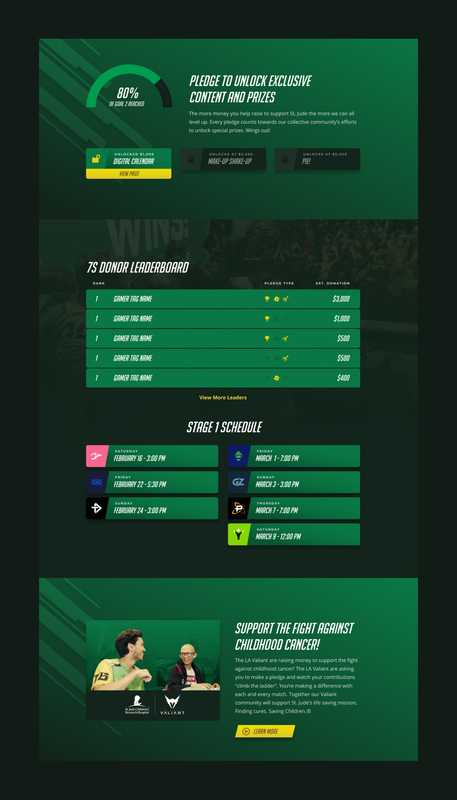 I was able to art direct and design this web page from start to finish. 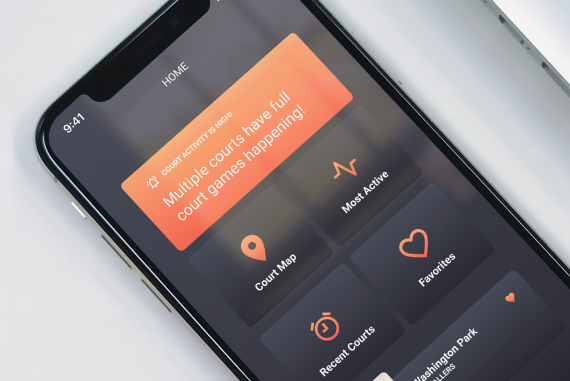 The campaign reached nearly $10,000 within the first couple weeks of launching. 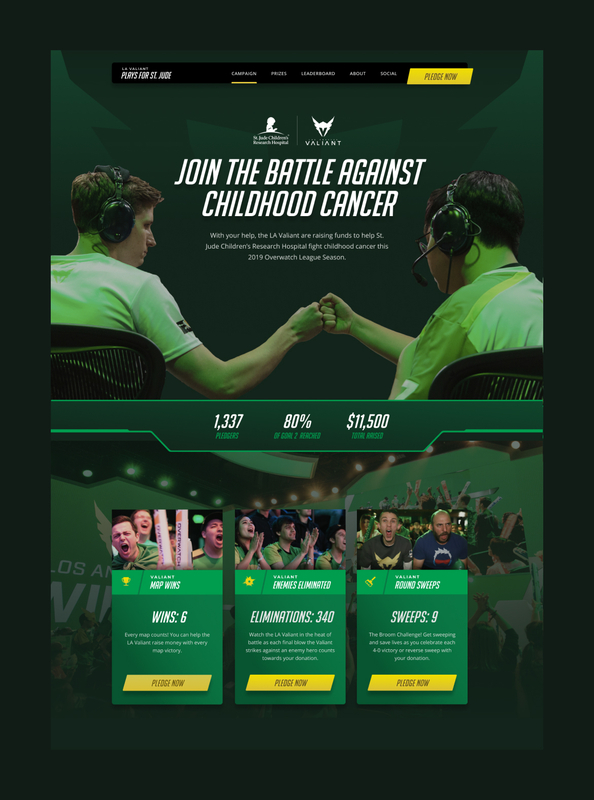 The LA Valiant will continue to raise money for the children of St. Jude’s Hospital as the 2019 Overwatch League season continues.